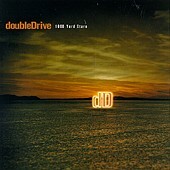 On their debut, doubleDrive, an Atlanta-based quartet, serve up heavy modern rock with a radio feel to it. It has a few edges, a few punches, and some fury in it, but, for the most part, is just your typical heavy radio band waiting for the day that their clean produced songs hit the airwaves and take the record buying public by storm. Though that may be the case, the generic feel overwhelms this album. Its edges are few and far between, while the grooves are deep and powerful, but never last long enough to really keep your interest. Songs like "Hell," "Sacrifice," and "Stand By" all have a what it takes to make a good song -- lots of energy, fuel, momentum, and desire -- but the band can't bring them to life and fully utilize them for the songs' benefit. "Stand By," a melodic hard rocker, was one of the few tracks on this disc that really grabbed me and made me take notice. The rest of them flew by in typical mediocre modern rock fashion. Another major label story where the label saw something they felt they could mass produce, snatched them up, and the outcome was a glossy, short-of-edges rock record that is about as dangerous or intimidating as an old woman. I'll give it a D+.